How Willa Got Her Groove Back trapped me from page one with Willa's infectious narration. Page after page, I gorged myself until the very end when I realized the afternoon had waned to evening without coming up for air. This Young Adult novel was everything I enjoy about the genre: the feels. I can't explain why YA novels always seem to evoke so many emotions in me. For both Willa and Finn, I was frustrated, angered, heartbroken, heartstring-tugged, and happy. There was a definite growth in Willa as the book progressed. I can see where readers may find her a bit judgmental and snobbish, especially adult readers. But Willa's story perfectly portrayed the powerlessness of youth, where you're the passenger while your irresponsible parents are in the driver's seat, maybe driving you in a direction that is negative for all, without a thought or care for you or your opinions on your life. Imagine everything you've ever known changing in a heartbeat, just because your father or mother has on lust-goggles and is being led around by a body part that shouldn't get a say in your life. I was frustrated, angered, and hurt for both Finn & Willa. Should children get a say in their parents' love lives? NO. But they should be taken into consideration and treated with respect, instead of throwaway objects used as props and remembered when the parents need a 'family' experience & this isn't just something that happens in books, more like the majority of homes. Just thinking of how powerless this leaves the children gives me the shakes. Willa finds out her absentee father is marrying a superstar actress, after he fails to tell her he's even dating anyone. Just shows up and drops it into her lap. There's a level of betrayal, as the man who was written to be her partner in crime is so love-fogged he notices nothing but his new fiancée. But as you read along, the reader realizes the father was built up in the daughter's mind, and not at all her partner and knight in shining armor. Willa's emotions are written across the pages, and the reader feels them with her. Several gut-wrenching moments, and a few time tears escaped my eyes. The narrators are both Willa, and her soon-to-be stepbrother/love interest, Finn. But Willa has the most page time. They are polar opposites except in the way they love their respective parent, so this gives the reader a 360-degree view of the storyline. This is in no way a standalone, but not a cliffhanger. The ending was definitive in respect to the storyline, but it left a major thirst for more. That addictive 'what's next?' sensation that has a reader one-clicking the next in the series, and that's a very good thing in my opinion. I can't wait for book #2, and I can already guess it's going to be an angst-fest of epic proportions with the threads opened near the end of book #1. Can't wait to get my hands on it. Emily McKay is a life-long fan of books, pop-culture and anything geeky. She has a black belt in Tae Kwon Do baking cookies. She lives in central Texas with her husband, kids, two mildly-psychotic dogs, a three-legged cat and eleven chickens. 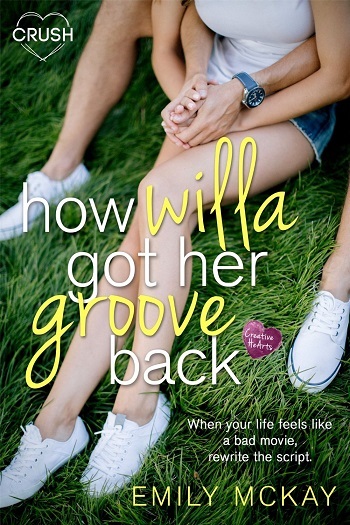 Reviewers on the Wicked Reads Review Team were provided a free copy of How Willa Got Her Groove Back (Creative HeArts #2; Willa and Finn #1) by Emily McKay to read and review.